The UN has appealed for $951 million to meet the needs of nearly 900,000 Rohingya refugees in Bangladesh, reports Ians. “We are talking about truly critical needs here both on the part of the Bangladeshi communities who have so generously opened their doors and of a stateless and refugee population that even prior to this crisis was among the world’s most marginalised and at risk,” UN High Commissioner for Refugees Filippo Grandi said in Geneva. Grandi’s remarks came on Friday while he was launching the 2018 Joint Response Plan for the Rohingya humanitarian crisis. Over the months since the most recent Rohingya influx began, it has become the world’s fastest growing refugee crisis — with tens of thousands fleeing by land and sea daily from Myanmar’s northern Rakhine state at the peak of the emergency. The Bangladesh government and people responded with generosity and hospitality to the 671,000 Rohingya refugees who have arrived since August 25. Almost seven months in, refugees continue to arrive and the situation in Bangladesh’s Cox Bazar remains fluid. The Kutupalong-Balukhali site, where some 600,000 refugees are living, is now the largest and most densely populated refugee settlement in the world. 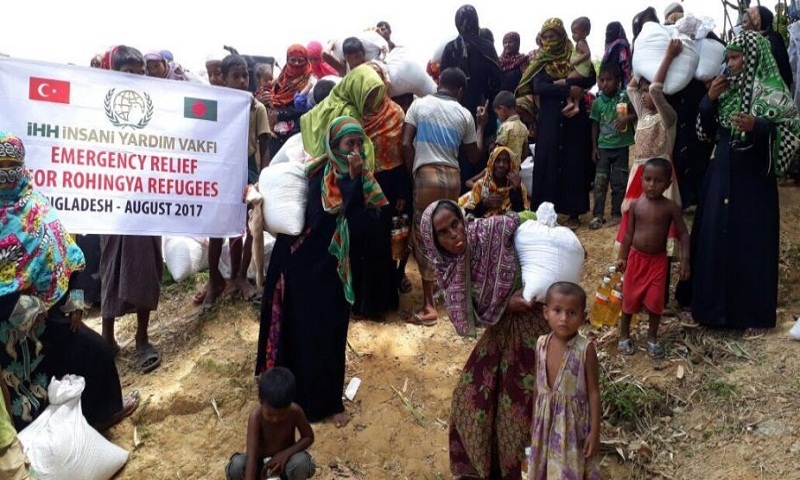 Complementing Bangladesh’s continuing efforts, the 2018 appeal aimed to bring together over 100 UN agencies and national and international non-governmental organisations to ensure that refugees and host communities receive the life-saving assistance, protection and the support they desperately need. It also included contingency planning for 80,000 more refugees in the coming months. Fifty four per cent of the appeal was to ensure food, water and sanitation, shelter and other basic aid, with food alone accounting for 25 per cent of the total. So far, the emergency response from September 2017 to February 2018 has received $321 million of the $434 million required.